In the summer premiere of Shadowhunters, audiences are introduced to a new villain, Azazel, a greater demon and one of the Princes of Hell. We first meet him as a dapperly dressed man seemingly in his mid-twenties. He enters a bar called the Heslodge where two Shadowhunters (in the retinue of Inquisitor Imogen Herondale) are seated. He asks them where the Mortal Cup is and they are clearly surprised that someone they don’t know is asking them classified information. But before they can whip out their seraph blades, he immobilizes them with a spell and explains that he knows that they are with the Inquisitor and that they have Valentine Morgenstern (Alan Van Sprang) in their possession. The bearded Shadowhunter says that the Circle leader won’t tell them where the cup is being hidden and Azazel (Brett Donahue) comments with, “pity,” and then chokes them both. When the bartender sees the two dead Shadowhunters she is alarmed and the demon decides to make it a party by killing everyone in the entire restaurant as well. The next time we see him is when Izzy is trying to score some vampire blood in a dingy alley down in the Financial District. Why he decided to target her specifically is unknown, or could it have been a coincidence that he was just trying to get answers from any Nephilim? Isabelle’s (Emeraude Toubia) demon necklace begins to pulse in alarm but she’s too distracted to notice, only needing to get her fix. Azazel’s power is too great though and the stone breaks. Izzy tries to fight back and three men (or vampires?) try to help her but the demon easily kills them. Out of the blue, Sebastian (Will Tudor) arrives and displays some acrobatic moves. He strikes Azazel with a seraph blade but the creature transfigures himself into a thousand moths and disperses. 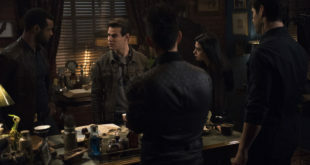 Meanwhile, Alec (Matthew Daddario) has gone to Magnus’s (Harry Shum Jr.) loft for help in determining what greater demon killed the Shadowhunters and the mundanes at the bar. He gives the warlock a small bag of black sand, saying that it had been left with its victims. Magnus looks disturbed and says that this is from a demon dimension called Duduael. Supposedly, the greater demon Azazel had been shackled there for centuries. He had been the creature that gave man the weapons of war and was a Prince of Hell. While out looking for Isabelle, Magnus and Alec find the dead bodies of Azazel’s recent kills and worry that she is with the demon after they find her broken necklace. Back at the Institute, Alec tells Clary (Katherine McNamara) and Jace (Dominic Sherwood) what’s been happening and the two former siblings talk to Valentine thinking that he must know what’s going on. They confront him and Clary exclaims that someone must have broken Azazel out. Jace says that it must have been Circle members who did it in order to break Valentine out of the Institute. However, Val does bring up a good point that if a great demon wanted to free him why would he still be inside here with them. 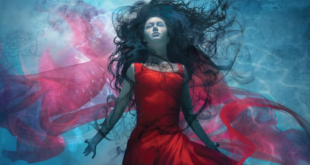 Clary demands then that if her father wants to destroy demon presence in the world then he should tell him followers to give them the cup so that they can use it as bait to get Izzy back. Valentine though claims that he doesn’t know where the cup is and that if they were smart they would use him as bait instead. Clary convinces Jace that they don’t have a choice and that they need to rescue Izzy. 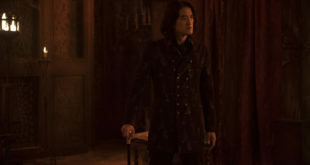 With Magnus’s help, Azazel is summoned via a pentagram and is questioned on Isabelle’s whereabouts in exchange for Valentine and the Mortal Cup. He claims that he doesn’t know where she is and then is able to break the binding spell. Clary’s sunlight rune was supposed to banish him but it doesn’t seem to work and Azazel renders them useless. He then switches the minds of Magnus and Valentine. Somehow though Jace is able to withstand the demon’s magic and tries to attack him, but he gets away once again. We finally see Jace’s golden eyes on screen! So while we still don’t know who released the greater demon from his shackles, we do know that he wants the Mortal Cup to destroy it since whoever wields it can have power over his kind. He seems to have played a prank on Valentine by switching his mind into Magnus’s body, but that doesn’t mean that he somehow doesn’t some kind of arrangement with the man. Azazel is very much a wild card at the moment and his sudden appearance along with Sebastian’s can’t be a coincidence. But what do we know about him and greater demons in general? SPOILERS FROM TMI AHEAD. STOP NOW IF YOU HAVEN’T READ THE BOOKS. In the City of Lost Souls, the fifth book in The Mortal Instruments series, Azazel was summoned by Magnus to gain knowledge on a weapon that could break the demonic parabatai bond between Jace and Sebastian. The demon told them that there would be no way wherein they could hurt one and not the other but he had an idea. However, before revealing this he would need a happy memory from each of them. Once he had his bounty, Azazel said that he would need to be released into the world where he would then take Jace to hell and keep him alive there long enough until the bond would break. The catch is that the demon would have to remain free. Disturbed, Magnus said they’d consider his offer and then banished the creature. Except that he wasn’t completely banished from the warlock’s apartment because of his sheer demonic strength, his presence was still connected to the pentagram. At one point Magnus’s cat strayed too close to the marking with Simon swooping in to grab the animal, only to then be in the clutches of the demon. But because he bore the Mark of Cain at the time, Azazel’s attack rebounded. He then left of his own choice after seeing the mark on Simon and claiming that he his freedom was not worth tangling himself with them. Azazel had once been an angel himself who had fallen with Lucifer from Heaven. Each Prince of Hell had his own dimension and he was bound to Duduael. They also had intelligence, the ability to converse, personalities, and of course names. No Shadowhunter weapon could truly vanquish one of them, only scatter their essence into the Void where it would eventually reform, albeit slowly and weakened. Other greater demons include Lucifer, Lilith, Asmodeus, Abbadon, and Sammael. His introduction as a new villain on Shadowhunters is interesting as now Valentine is roaming the streets of New York in a warlock’s body because of him. He certainly is going to cause all kinds of trouble for the Nephilim but does he really just want the cup to destroy it? Or does is there some other hidden agenda? His arrival though definitely expands the universe a little bit more and it’s going to be great fun to see how this plays out. Catch Shadowhunters Mondays at 8 PM on Freeform. For more on Shadowhunters click HERE.